Japan always seems to be one step ahead of the rest of the world in space-saving living. Case in point is a capsule hotel in Kyoto called 9 Hours. The name is based on the idea of 1 hr to shower, 7 hrs to sleep and 1 hr to rest. While capsule hotels have been around for a while in Japan, they have been more focused on function than form. 9 Hours’ super sleek interior and ample amenities give a luxury feel to what is essentially sleeping in a cubby. The developers express that they are not interested in replacing full-size hotels–merely providing an alternative for people who may literally need a place to sleep and nothing more. The video asks if the US and Europe are ready for this style of hotel. We suspect it’ll come down to cost. If a space is 20% the size and 20-30% the cost of a standard hotel room, it will create a compelling argument for booking a pod. Ultra-sleek environs like 9 Hours will make the decision to go with a capsule easier as well. What do you think? 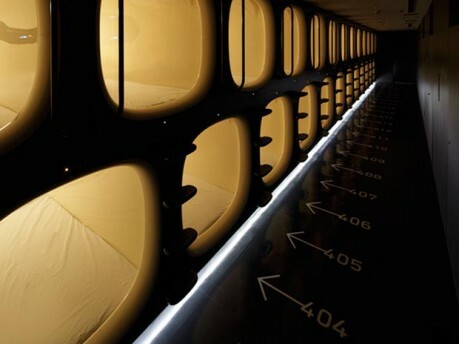 Have you stayed in a capsule hotel? What was your experience. Would you? If not, why not? There is NO WAY I’d sleep in one of those things. Too enclosed. It’s too much like being in a coffin. Absolutely NO WAY. I WISH they had something like this in New York. Seriously, there can be long days in NYC, and there are times where I wish I could just take a nap between engagements. This would be so perfect and I would definitely use it. Much better than trying to catch some zzzz’s in a movie theater!